Where Is The Best Area To Stay In Kyoto? The following are the best, most convenient areas to stay in Kyoto, listed in rough order of priority, with the most convenient places listed first. All things considered, Downtown Kyoto is the best place in the city to be based. You’ll be within walking distance of hundreds of restaurants, shop and bars, as well as both of the city’s subway lines and two train lines. Downtown Kyoto is also within walking distance of two of the city’s main sightseeing areas: Southern Higashiyama and Northern Higashiyama. See our full list of recommended hotels on the Downtown Kyoto page. Southern Higashiyama is also a great place to be based. It’s near some of the city’s most impressive sights and there are plenty of restaurants scattered about, especially if you stay in or near Gion. Best of all, the lanes of Southern Higashiyama are incredibly atmospheric for strolling in the evening. See our full list of recommended hotels on the Southern Higashiyama page. Kyoto Station is a good place to be based. There are plenty of restaurants and shops and, of course, you’ll be very close to Kyoto Station, which is convenient for trips to other parts of Japan, as well as buses to all parts of Kyoto. The downside is that you’ll have to travel to do your sightseeing in Kyoto. See our full list of recommended hotels on the Kyoto Station Area page. Central Kyoto encompasses a huge area in the middle of the city. There are several good hotels in Central Kyoto that aren’t too far from downtown and the subway lines. 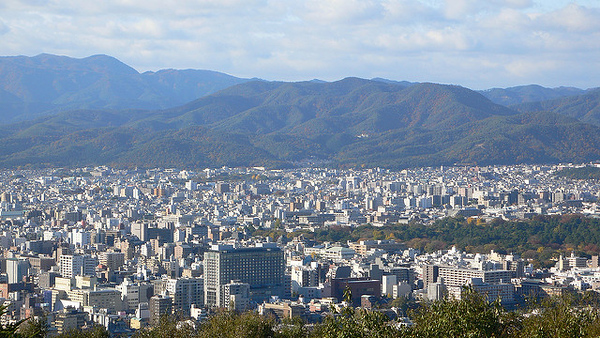 The downside with staying in Central Kyoto is that you’ll probably have to travel to the main sightseeing districts as well as the restaurants and nightlife of downtown. See our full list of recommended hotels on the Central Kyoto page. Northern Higashiyama is a good place to stay, particularly if you want to be near greenery and don’t mind getting on your bicycle or a bus to get downtown for eating and shopping (of course, there are some restaurants in Northern Higashiyama as well). There aren’t many hotels in Northern Higashiyama, but there are some ryokan, guesthouses and vacation rentals. See our full list of recommended hotels on the Northern Higashiyama page. All the way over on the west side of the city, Arashiyama is not the most popular place to stay, but it’s good for a night or two if you want to stay close to nature. Two of the city’s finest accommodations are here: the superb Hoshinoya Kyoto, which is accessible by boat up the Hozu-gawa River, and Arashiyama Benkei, a classic ryokan with wonderful views of the mountains. You can read more about Arashiyama’s many attractions on the Arashiyama page. All the way up in the mountains north of the city, the hamlet of Kibune is good for those who want to escape the city for a night or two. It’s home to the breathtaking Ryokan Ugenta, a romantic hideaway beyond compare. Read more about Kibune’s attractions on the Kurama and Kibune page. 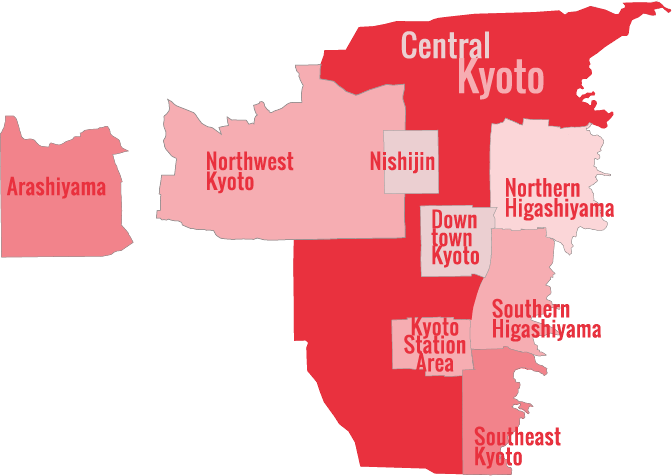 Click the menu icon on the top left of the map to see the name and ranking of each Kyoto district. In Kyoto, you can stay in everything from dirt-cheap guesthouses to five-star international hotels. Kyoto is packed with ryokans (traditional Japanese inns), making it a great place to sample this wonderful “only in Japan” experience. Just be warned that good ryokan can be very expensive (don’t forget that they usually serve meals) and staying in one is a little more involved than staying in a hotel. Thus, I often advise people to spend their first night in Kyoto in a ryokan, and then move to hotel for the rest of their stay. Kyoto is home to some of the finest ryokans in Japan, like Tawaraya and Hiiragiya, as well as some great foreigner-friendly budget ryokans like Ryokan Shimizu. For more on Kyoto ryokans, see the best high end ryokan, best mid-price ryokan and best budget ryokan pages. Kyoto has a fantastic selection of hotels, ranging from the top-of-the-line Hyatt Regency, to the superbly located Kyoto Hotel Okura, along with good value places like the Palace Side Hotel. For more on Kyoto hotels, see the Best Kyoto Hotels for Families, and Kyoto Hotels with Free Wifi. Business hotels are inexpensive hotels with small but adequate rooms with all the features you need. They’re usually an excellent value and they welcome travelers. Some of Kyoto’s best-value business hotels include the Toyoko Inn Kyoto Gojo-Karasuma and the Hotel Sunroute Kyoto. :: Check availability and pricing for Toyoko Inn Kyoto Gojo-Karasuma on Booking.com or Agoda.com. Guesthouses have exploded in popularity in Kyoto in recent years, and it seems like a new one opens every week. There are some fly-by-night places out there, so we suggest staying at a well-established place like the excellent Tour Club or Budget Inn. You can see more recommended Guesthouses on the Kyoto Hostels And Guesthouses page. Several foreign residents and a few locals have turned their houses into informal B&Bs in recent years. If you don’t mind sharing common areas with a family and other guests, you might find these a good option and the owners are usually a good source of information. There are dozens of houses and apartments available in Kyoto for use as vacation rentals. These are a GREAT option for families, small groups and anyone who wants to save money by self-catering. Some of the best vacation rentals in Kyoto include The Gion House, The Gion Apartment and Koto Inn. See our recommended Kyoto Vacation Rentals page for more info. 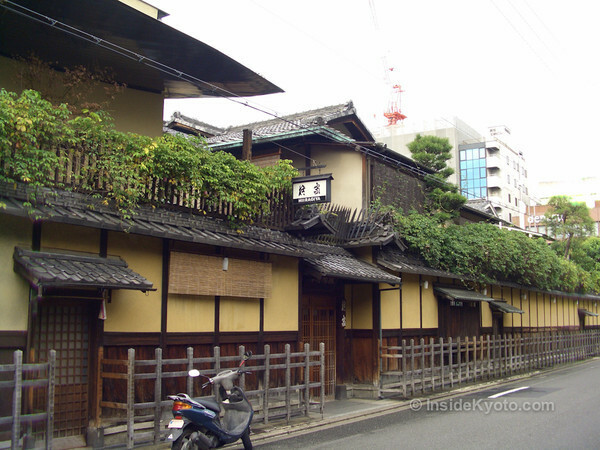 Kyoto is famous for its wonderfully atmospheric traditional townhouses, known as machiya. A night in a beautifully restored machiya is an unforgettable experience – there are several available to book online. See our Kyoto Machiya page for full details. A FRIENDLY WARNING! Kyoto accommodation gets booked out months in advance for busy seasons like the late March to mid-April cherry blossom season and the November fall foliage season. Book well in advance for these times. If you are having trouble finding places to stay in Kyoto, see my guide to Where To Stay If Kyoto Is Fully Booked which gives you several alternatives for accommodation.